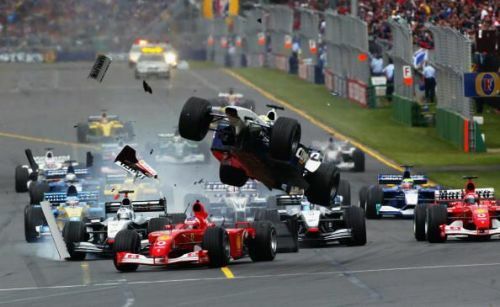 There have been some huge crashes in Australia over the years. After a pair of relatively dull races in the past two years down under, calls have been made by some sections of the F1 fanbase to remove Albert Park from the Formula 1 calendar. This is due to the track's layout, which doesn't promote overtaking, just ask Max Verstappen. However, while the passing opportunities may be lacking, overall action isn't, as there have been some tremendous scraps and huge crashes over the years in the city where a day can contain all 4 seasons. Here are 3 of the biggest wrecks in the event's thirty-plus year run. 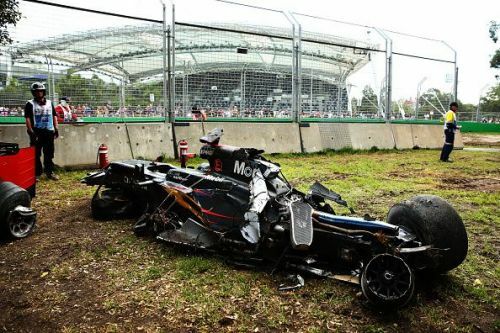 This was what was left of Alonso's McLaren after the crash. While Sebastian Vettel and Kimi Raikkonen were leading the race on Lap 17 of 57 of the 2016 Australian Grand Prix, our attention would soon be drawn further back down the grid. Fernando Alonso of McLaren was challenging Esteban Gutierrez for the lower reaches of the points, and Alonso seemed as though he would overtake the Mexican with relative ease going into Turn 3. However, Gutierrez swerved and broke unusually early, something that even Fernando's cat-like reflexes couldn't react in time for. 'Nando's McLaren ploughed into Esteban's Haas and got airborne, not touching the ground again until well into the gravel trap, ending up at the edge of the barriers. His MP4-31 was a wreck, but the Spaniard was still in one piece and emerged from the smouldering wreck, albeit with a limp. Needless to say, the red flags were brought out, but more importantly, both the involved in the crash were relatively alright. The double world champion would miss the next race in Bahrain as a precaution, handing an F1 debut to Stoffel Vandoorne.